A world first for Second Life Machinima? I’m “borrowing” the title of this article from a UWA blog post by Jay Jay Jegathesan (Jayjay Zifanwe in Second Life), who also e-mailed me about the forthcoming Eugene International Film Festival and the special place Second Life machinima has within it. In short, Metaphor, a film directed by Basile Vignes and produced by Jay Jay, has won the Best Animated Short Film at the festival, in a competition that included the internationally acclaimed animated short iRony, which has already won 120 awards world-wide, and has been short-listed for 5 Academy Award Qualifying festivals. It is believed that no other Second Life machinima has previously won the top prize in open competition against ‘conventional’ animated short films from across the spectrum. As the winning Animated Short Film, Meatphor will be shown at the festival, which takes place over the weekend of the 9th through 11th November, 2018, in Eugene, Oregon, USA, along with all the other selected entries. 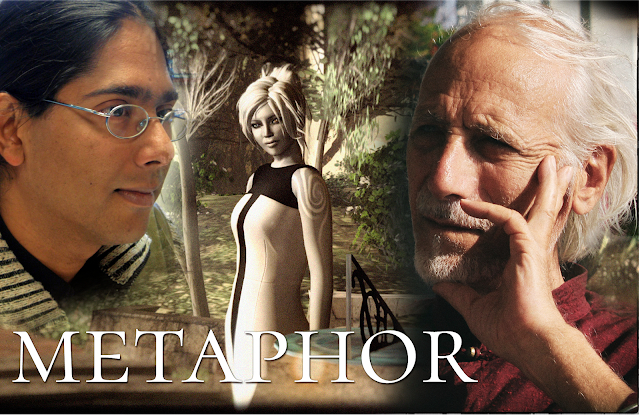 I am very proud and honoured that Metaphor won this award for best animation. This in competition with a selection of films each of which could have had the first prize. A big thank you to the jury who chose my film and congratulations for your excellent movie Festival. The protagonist in this film, uses the avatar and handle ‘Fallen God’ when accessing social media and virtual worlds. In his virtual journeys, he comes across the mysterious, beautiful and enchanting ‘Encre’. Will this encounter turn into a relationship touched by the spark of the infinite? This animated French-Australian film, based on true events that happened 2017 explores the many masks we wear along with the question of identity and relationships in the modern world in all its shapes and forms. Over the years as Festival Director for numerous UWA machinima film challenges, Basile proved to be among the finest exponents of this genre, along with his chief animator, Tutsy Navarathna, and when the thought came to me to try to take Second Life machinima across the globe on the international film festival circuit, I could think of no one better to partner with on this endeavour. This is the very first win for Metaphor, and I do hope that it’s not the last. I also look forward to the film’s Australian premiere next month at the Perfect Light Film Festival in Broken Hill, New South Wales. Congratulations to Basile, Jay Jay and all involved in the project on winning this award. I’d also like to point out that iRony, mentioned above, is in fact an animated short by Jay Jay’s son, Radheya Jegatheva (it is also narrated by Jay Jay). Radheya is fast emerging as a talented film-maker, and I’ve been fortunate to cover some of his work previously in these pages (see here and here for more). This being the case, I’d also like to pass on congratulations to him on also having iRony accepted by the Eugene International Film Festival and featured as one of its selected films, and on his film having already achieved so much internationally.